You just walked in the door and the kids are ready to eat. No worries. 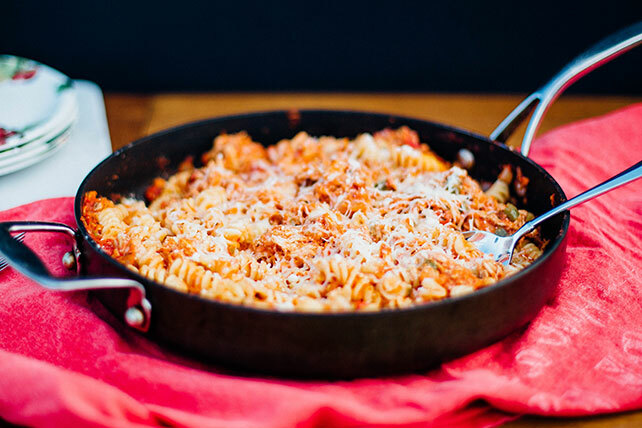 This Three-Cheese Chicken & Pasta Skillet is ready in under 30 minutes. Meanwhile, heat oil in large skillet on medium heat. Add vegetables and garlic; cook and stir 3 min. or until vegetables are crisp-tender. Stir in chicken, sauce and oregano; bring to boil, stirring frequently. Remove from heat. Drain pasta. Add to sauce with Singles; stir. Top with mozzarella and Parmesan; cover. Let stand 5 min. or until mozzarella is melted. Serve with a crisp green salad tossed with your favorite KRAFT Dressing. Prepare using your favorite pasta.